Bounty Road - Auto Gang RPG! TIGSource Forums Community DevLogs Bounty Road - Auto Gang RPG! You take on the role of an infamous bounty hunter. An anonymous source offered a hefty amount of credits for the execution of the self-declared “Lord of the Desert”, a rebel leader hiding far away in the land of sand. You gather your gang of loyal road warriors to take on the job and prepare for a long journey full of hazards. Bounty Road is a combination of classic Party RPGs with the roguelike genre. You control a group of cars, which each has unique attributes depending on chassis, armament, armor and drivers/gunners. Light motorcycles will stay just as relevant as heavier vehicles through their unique loadouts. You will depend on recources like food/water, gas and spare repair parts to make your way through. The people that come along will improve in skill, but without proper tactics you won’t win the fight. So yeah, I hope that gives you some insight on what kind of an athmosphere we want to convey. The game is in a state where almost all systems of the main game loop are working in a prototype state. There is an inventory, changeable parts, weapons with different skills and attributes and some basic AI patterns. What's missing? The map overview is not implemented correctly yet and I have no dialogue system in place yet, but both of these are rather trivial to implement. Apart from that - content. Me and a good friend are working on this game for little over one month part-time and obviously we try to implement game systems first before filling the world with different entities which are just variations of the core system. But we are very confident that the work is manageable. If you still haven't lost interest, here are the latest videos of game system updates. Re: Bounty Road - Auto Gang RPG! This looks like it could be pretty cool. I'm kind of getting a mad max sort of vibe, and I like that. I feel that the combination of classic RPG and rougelike could work really well in a game like this. It seems very fast paced but yet very much like a strategic survival game at the same time. I kind of feel like the gif with the grass blowing is a bit disorienting, but that could just be me. Yeah Mad Max is definitely one of the inspirations, it was also source for the initial art design and direction, but we are slowly straying away from that. For example the game will probably incorporate stuff like Drones (quadrocopters) for AOE control / healing, which is much more akin to a classic RPG. Let's see how that works out. I really like the long flags, they remind me of the long red scarves some characters have. I also like the desert set better than the field. What about some old roads? Yeah there won't usually be large areas of grass, the game will be placed mostly in rocky/sandy areas. Eventually implementing canyons and roads along cliffs is a goal, though creating a working and fun prototype will come first. Not sure if I'll stick to the "triangle style" orange desert or the more realistic looking smooth beige one, which I use right now. Is the smoke going to affect gameplay at all? Maybe block the AIs vision, cause car damage or slow the other cars down or something? It looks nice. Something I've been thinking about, maybe along the lines of make the shooting less accurate if through smoke. But not implemented right now. 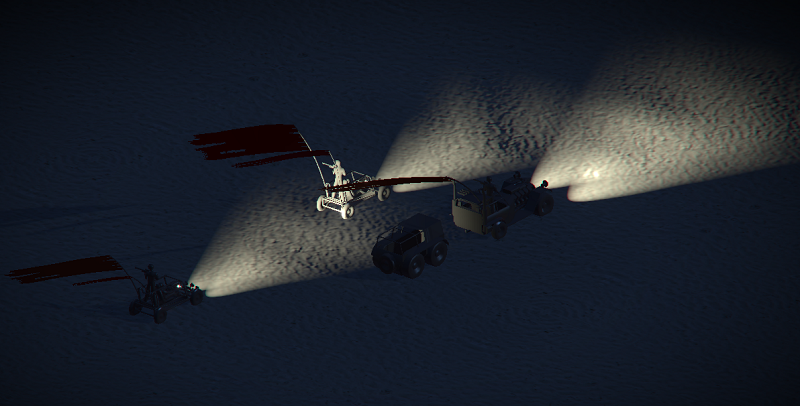 I decided to implement local point and spotlights for more athmospheric night scenes. Not optimized right now, maybe I have to go the deferred way, but right now the performance drop is not too heavy. I guess optimizitation should come around once more final scenes of the game, with more assets and cars are rendered to really determine what is a bottleneck and what is not. Looks very interesting. Will there also be environmental hazards? Also is the main objective getting to the end or something? Ever thought about Convoy missions? The goal is to cross the desert in hopes of finding the "Lord of the Desert" to earn the bounty that was put on his head. Convoy missions? Maybe what you had in mind is relatively close to how the game will play actually, since it's basically always the priority to defend your main supply truck, which is constantly moving. I like how immediate the gameplay seems to be. Which tools are you using for this project, if I may ask? Visual Studio for the code, Blender for models, different ones for textures. The engine is self-made, on top of MonoGame Framework. 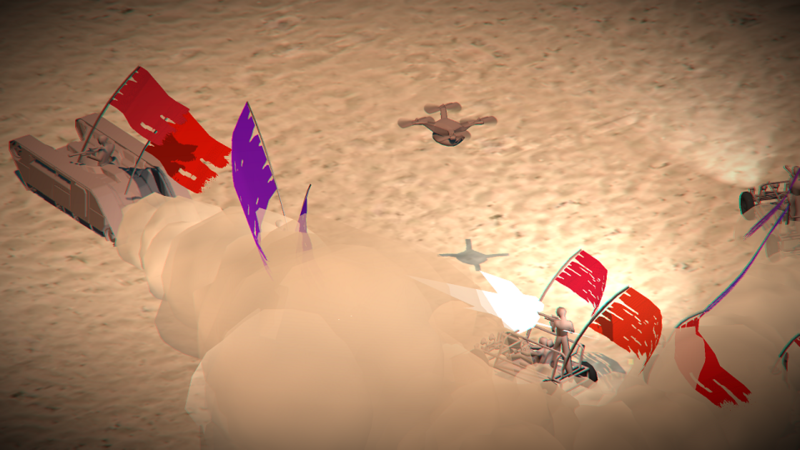 I added a lot of FX lately and changed tons of code which can't be shown in pictures, really. 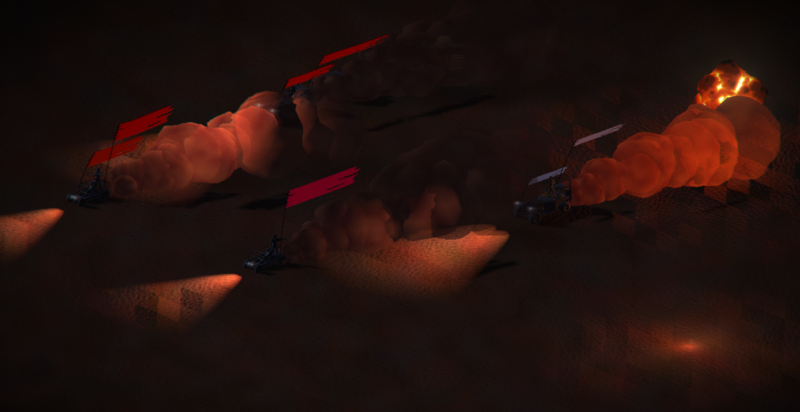 I improved the lights and I added support for smoke receiving light. I also added optional lens glare/flare/corona (what is it?) to the lights to give it a point of origin. I think the night looks pretty athmospheric, what do you guys think? I'm really looking forward to this now -- huge Mad Max fan. I fucked up the sound recording, and now thanks to noise cancellation my voice is barely recognizable ... noticed that way too late. But - you can turn on subtitles, that should help. No gameplay changes in this one, only graphcis and AI. I'll be looking forward for this one. Right now they are cosmetic only, yes. I am torn on this issue, on the one hand they really give this feeling of being really "thick" and look like they would probably a nightmare to drive in, so it would be quite realistic if it would obscure vision and lower accuracy - on the other hand it brings a lot of new complexity. The game already has many things to consider in terms of orientation - the "armor" of the car can be destroyed individually on each side of the car - so that is one thing to consider both for the enemies and yourself when you plan the attack. Then there are weapons (like the MG) that can only fire in an arc in a certain direction, which you also have to take into account. Same thing for abilities like ramming etc. So I am not sure if it's actually good for the player if he has to incorporate yet another factor. Plus, if he has weapons that are front facing he basically has a permanent accuracy malus. Well I am still undecided, it's maybe something i need to try out. Or just make the dust clouds smaller / more transparent. I don't know. So I readded the tank model (you can see it on the left, with no turret, just a gunner) and I added a basic drone / quadcopter model to the game. Why a drone you ask? Well this is my realization of having a "control mage" so to speak. It will be an alternate armament for a car - instead of having a basic rifle, a gattling gun, rocket/torpedo launcher etc. the car will have a drone operator and some drones to deploy. The idea is to have some "Area of Effect" modifier for a set time. a smaller / different version could help make repairs on the cars mid-fight. they could give better vision and help make more precise shots. they are equipped with some light firearms to lay down some fire. So yeah, what do you think about that? Another visual thing I finally implemented is some geometry muzzle flashes. Together with some lights and the bloom effect it looks pretty good i think. All of that comes on top of some big background changes, where I changed how I order meshes and send them to the gpu. 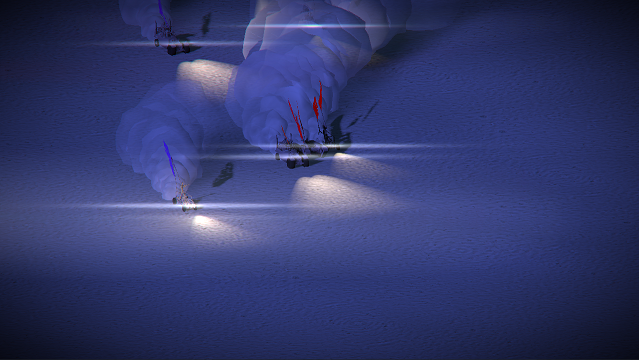 I also implemented instancing, for example for the smoke. I thought this was non trivial since I compute position, speed and other properties on the GPU, but it worked out fine. So yeah - that's it for now.